The deadly collapse of a dam at the Samarco mine in Brazil was due to design flaws, according to a report. 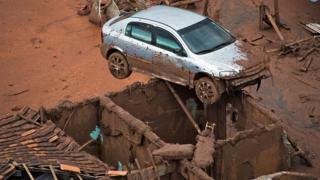 The Fundao dam-burst disaster caused a huge mudslide which killed 19 people and polluted a river. The technical report, commissioned by Samarco's joint owners BHP Billiton and Vale, did not assign blame for the disaster. A separate police investigation has accused iron miner Samarco of wilful misconduct, which the firm denies. Dams holding mining waste, known as "tailings", commonly have walls made of a mixture of sand-like particles and clay-like silt. The report said that a change in the Fundao dam's design between 2011 and 2012 led to less efficient water drainage, and ultimately to the dam's collapse in November 2015. Sand in the dam walls became saturated, and abruptly started to behave more like a liquid, in a process known as "liquefaction". "There was a fundamental change in the design concept whereby more widespread saturation was allowed and accepted," the report said, adding "this increase in the extent of saturation introduced the potential for sand liquefaction." There was increased weight on the tailings as the height of the dam was raised to more than 100m. This weight pushed clay-like silt in one part of the dam outwards "like toothpaste from a tube," ultimately causing the dam to collapse. "The tailings that had been solid ground just minutes before transformed into a roiling river, overtopping but not breaching the downstream Santarem Dam, then entering the town of Bento Rodriguez shortly thereafter en route to its ultimate destination in the sea," the report said. A small earthquake on the day of the dam burst may also have "accelerated" the failure, the report added. Carlos Eduardo Pinto, a prosecutor in the case against Samarco, said: "Samarco has long claimed it performs good practice but the report did not demonstrate this. Quite the opposite, it showed the company altered the project in a way that would not have been permitted." In a statement, Dean Dalla Valle, BHP Billiton's chief commercial officer, said the dam failure had "a devastating impact." "In November 2015, BHP Billiton committed to making the findings of this investigation public, and we are determined to learn from this tragedy," Mr Dalla Valle said. BHP Billiton said it had reviewed 10 of its biggest tailings dams and found they were stable, but was taking steps to improve risk management. The disaster has already cost BHP Billiton about $2.2bn, including a total write-off of its investment in Samarco, due to uncertainty over when the mine will reopen. The figure also includes funds for its share of agreed compensation and damages.